I was having a chat with one of my Cardiac anaesthetist chums the other day about ‘stuff’ and in particular some of the rather interesting work appearing in the literature around the use of ECMO in the the ED. He has recently been trained in the use of ECMO and so he seemed like just the right person to talk through some of the concepts. The idea for this as an ED treatment was first introduced to me via Scott Weingart at EMCRIT , but we are also starting to see case reports and other uses of portable ECMO devices in the literature, and on reading #FOAM sites I sometimes think everyone else is doing it around the world (I don’t think they are to be honest). Fair enough I thought, there is no point in getting excited about new kit until we are assured that we are doing the basics right, but I wondered for a moment and asked myself (and him) whether time to cooling is a factor in the effectiveness of mild hypothermia post cardiac arrest? Is it really to be done immediately on the return of spontaneous circulation or is it perhaps more of an issue for later in the prevention of hyperthermia and control of metabolic activity? So we thought, looked fairly blank and wandered on, the question passing until this week’s evidence download picked out some letters referring back to a paper in Resuscitation earlier this year form the Italian Cooling Experience group (which is a pretty cool name for a research group in more ways than one). Anyway, their paper seems to directly address the issue in question. The abstract is below and you can link to the paper on Pubmed here. So this is an observational paper which does open it to a number of biases. Ideally you would want to test this as an RCT with early and late therapeutic strategies but we can only deal with what we have so although the methodological design is not perfect it is topical so let’s have a look. The ICE group appears to be a collaboration of Italian hospitals and the data collection here has been retrospective across these units. In essence they have collated data on all cardiac arrest patients and looked back to see if outcome data on the ICU and at 6 months differs depending on the time that hypothermia was instituted. 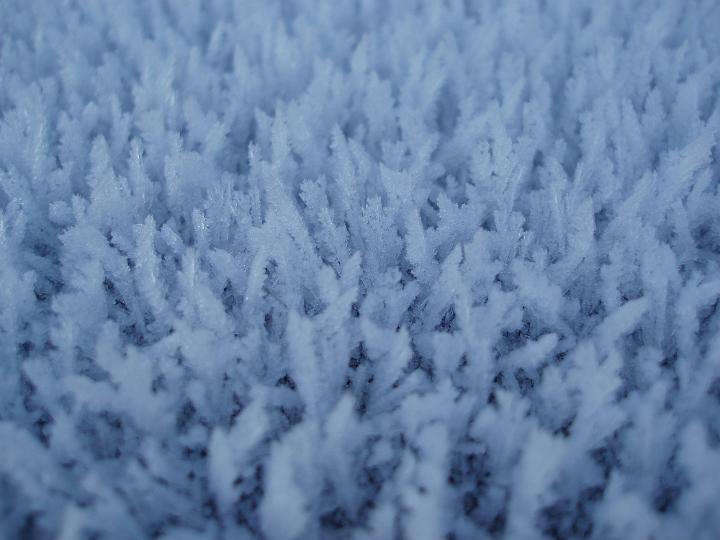 Their discriminator of time puts early hypothermia at <2 hours and late as >2 hours. Fair enough, but this is an entirely arbitary cut off and is somewhat stark in selection. One might postulate that when exploring observational data it might be more helpful to look at risk against time as a continuous variable rather than as a single cut off (as if there is a true pathological effect of timing of hypothermia you might expect it to get worse/better/change over time). So methodologically there are concerns about the design (retro, observational) and the analysis (arbitary time points and analytical restrictions), but again let’s not throw everything out just yet. If there is an association between time and outcome it might be an indicator of the need for more work in this area, and that may be useful in itself. What are the headline numbers? Firstly, the numbers are fairly small. Just 122 patients are included with 79 in the early cooling group. However, the main results are quite startling to be honest. At ICU discharge, hospital discharge, 1 month and 6 months there are statistically significant differences between the two groups in terms of survival (we like death at St.Emlyn’s as an outcome as it is fairly easy to measure). 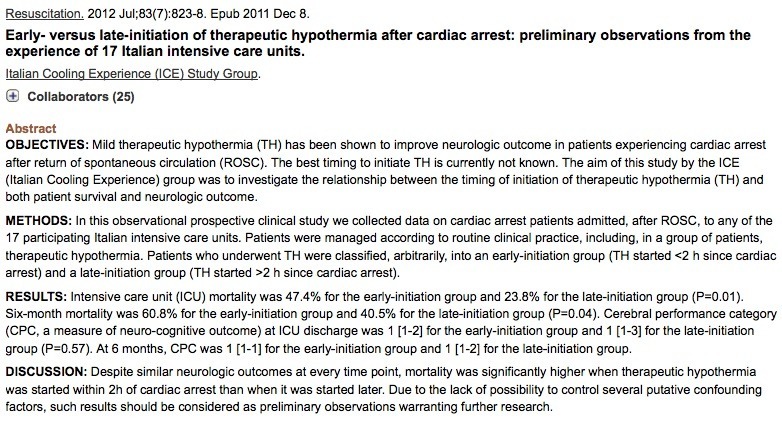 At ICU discharge there was already a difference with a mortality of 47.4% for early cooling vs 23.8% for late cooling. That’s a huge difference which equates to a number needed to treat of 4.2! As a therapeutic intervention that would be amazing…..and therefore arguably (perhaps cynically) too good to be true. Similarly at 6 months the difference is 60.8% dead in the early cooling group vs 40.5% in the late cooling group. The NNT for survival to 6 months is therefore 5. Again an amazingly powerful effect for late cooling. Such figures combined with the methodological concerns in the paper mean that I am suspicious that something else might be influencing the results here. The authors have analysed the data in a univariate way (just looking for one factor at a time) and arguably they should control for multiple factors (multivariate analysis) but the numbers are too small to do that safely here. Other papers in this area are also inconclusive or contradictory but there appears to be little in the discussion which helps us use this data to build a full picture of the effect of commencement of cooling, nor of the time needed to achieve cooling (quicker once started in the late group). So where does this leave me and my conversation with my cardiac anaesthetist friend? Well, from an evidence based medicine perspective there is not enough here to really change practice although the question remains valid and now that it has been raised it is certainly worthy of investigation in an RCT or perhaps by looking at a larger database with a multivariate analysis. For now it’s business as usual. Patients get cooled once ROSC has been achieved and this is something that we believe (note believe) should be started in the resus room. As for the future then who knows? Perhaps we will be delaying hypothermia in the ED? If we do that should give us enough time for them to engage in the question once again. What’s the absolute risk reduction in mortality at at ICU discharge? Right, time to get your head round RR, ARR and NNT as this is a great way of interpreting data. The absolute risk reduction (ARR) is simply the difference between the event rates so at ICU discharge the difference is 47.4-23.8=23.6% The ARR is arguably the easiest one to interpret. Relative risk is a comparison between the two event rates against each other so in this case it 47.4 /23.8 = 1.99 times the relative risk of death in the early cooled group. Similarly this could be described as a near 100% increase in mortality with early cooling or a halving of mortality with late cooling. What was the point of all those sums? Thanks for this Simon, educational as always! By coincidence I had been complaining about the lack of cold fluids etc in our ED very recently. I’d noticed this paper, but totally agree that this huge effect on delayed cooling just doesn’t add up. I’m going to keep starting TH ASAP for now, but who knows what the future will hold? Thanks Gareth, that other paper did not flag up on my search as yet which is interesting. It certainly makes the picture less clear overall, but if anything it seems to make more pathological sense. I am struggling to think of a mechanism for how early cooling could have such a profound adverse effect and that continues to raise my concerns about changing practice on the basis of the evidence presented. Like you I will continue to institute cooling soon after ROSC until we see something more definitive.